All Nevron SharePoint Licenses are per WFE (Web Front End) Servers and you need to obtain a valid Server License for each production WFE server in your SharePoint farm. There is no restriction on the number of web applications, the number of site collections, the number of developers/designers working with the web part designer and no restriction on the number of viewers. We do not charge for test and development servers. Why I don't see my license key? Your license key needs to be generated based on your SharePoint Production Web Front End (WFE) Server machine(s) ID. Before you can see your license key(s) in your account, you need to contact sales@nevron.com and provide the machine IDs. 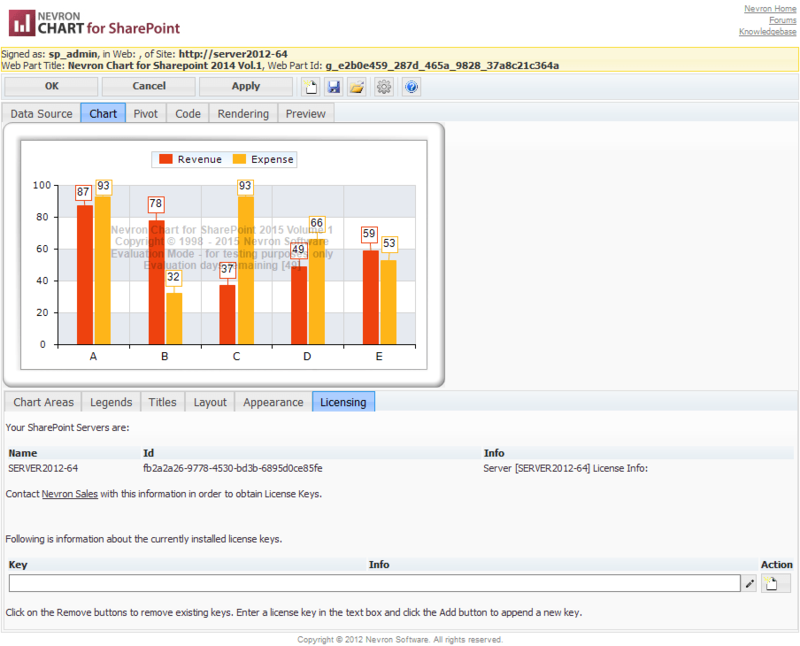 You need to license every WFE (Web Front End) Server in your SharePoint Farm. There is no restriction on the number of web applications, the number of site collections, the number of developers/designers working with the web part designer and no restriction on the number of viewers. We do not charge for test and development servers. Nevron SharePoint licenses are perpetual, which means that the license key you are provided with your purchase will forever unlock the specific version from your order. If you would like to have the ability to upgrade to newer versions you can either add subscription to your initial purchase or contact sales@nevron.com requesting update quotation. As mentioned in the above question, when you purchase Nevron Data Visualization for SharePoint you are entitled to forever work with the edition you have purchased (for example 2014.2 or 2015.1). The Subscription gives you access to all minor and major version releases within one year after purchase, priority support (plus 5 additional support tickets with your purchase) and the right to continue your subscription after it expires.